(28 August 2013)—On the heels of having her single ‘Missin’ a Man’ playlisted at BBC Radio 2, Nashville-based singer/songwriter Jenn Bostic has announced 11 U.K. dates, starting at London’s Borderline on 26 November. ‘Missin’ a Man’, the third Bostic song to earn Radio 2 support, is the title track from her new EP, which also includes ‘Not Yet (Orchestral)’ and ‘Superstar’. Her song ‘Jealous of the Angels’ (from the album Jealous) reached #1 on the iTunes Singer/Songwriter chart and was championed by Smooth Radio and Radio 2, while subsequent single ‘Not Yet’ achieved A-List rotation on Radio 2 as well as play on Magic and Smooth Radio. ‘Bostic is a star in the making’, AZ Weekly declared, ‘and Jealous is Exhibit A’. The video for ‘Missin’ a Man’ debuted on VEVO this week and has already logged more than 65,000 views. The emotional clip, filmed in Bostic’s favorite U.K. spots, can be found here. 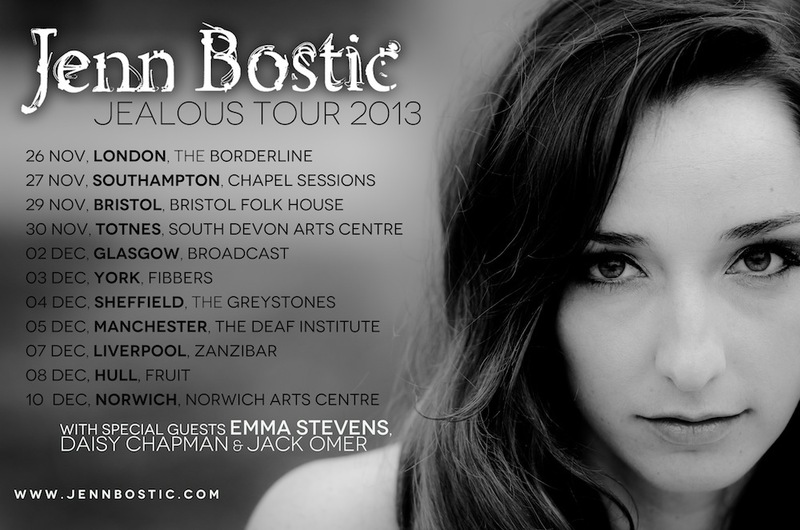 Bostic’s upcoming performances, which also include appearances in Southampton, Glasgow, York, Manchester and Liverpool, among other U.K. cities, will feature special guests Emma Stevens (named iTunes’ Best of 2013 So Far), Daisy Chapman and Jack Omer. Jenn Bostic started on her path as a singer/songwriter when she was 10 years old, in the back seat of her father’s car with her older brother on the way to school. A horrible crash that killed her dad, a musician who taught her folk songs like ‘Sunny Side of the Street’ and turned her on to Emmylou Harris and Bonnie Raitt, changed her life forever. Jealous’ first single, ‘Jealous of the Angels’, produced by Barrett Yertesian (Christina Perri, Andy Grammer), is a loving tribute to her father. It made a huge splash for Bostic in the U.K., with radio and critical success and more than 50,000 sold – all as an independent release. The video for ‘Jealous of the Angels’ has had more than 1.4 million YouTube views, and the single was championed by Smooth Radio and Radio 2. Bostic’s national TV appearances have included the coveted BBC Breakfast, which sent ‘Jealous of the Angels’ to #1 on the iTunes Singer/Songwriter chart. Bostic won five 2012 Independent Country Music Association Awards, including Overall Winner, Best Female Artist, Best Musician, Best Songwriter and Song of the Year for ‘Jealous of the Angels.’ Jealous made its US album debut at #22 on the iTunes Singer-Songwriter Album chart in June, the same week Bostic made her third appearance at the Grand Ole Opry. Her Missin’ a Man EP is available for pre-sale now, with wide release slated for 23 September.